Add a little more fun to your awareness. Join us in raising Colon Cancer Awareness by wearing this Colon Cancer Awareness T-Shirt. Perfect for both him and her to show their fight to end colon cancer once and for all. Each Awareness T-Shirt for Colon Cancer is available on our premium 100% cotton t-shirt, machine washable in sizes youth XS-L & adult S-3XL. FREE Personalization is included! 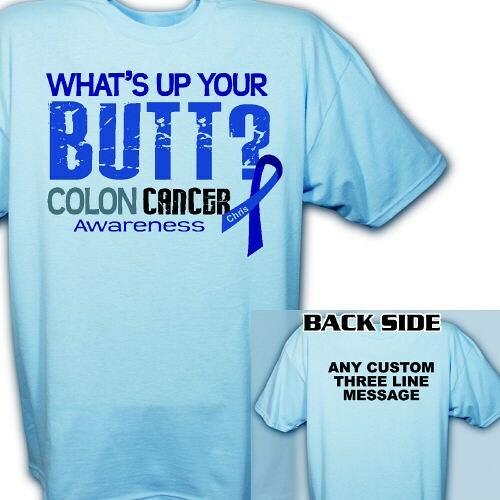 This Colon Cancer Awareness Shirt may be personalized with any name on the front awareness ribbon and any three line custom message on the back. Nice shirt great cause and personalizable. What more do you need. The shirts were exactly as pictured, actually better! I placed the order on a Thursday and received it the next day. Very impressed. I will definitely order from here again and recommend to others. Nice soft, mid-weight shirt. Following the recommended washing instructions, shirt did not shrink. Additional Info Our goal, at MyWalkGear.com, is to raise public awareness and understanding of Colon Cancer along with many other cancers & diseases. We are proud to help make a difference in the lives of those who are diagnosed with colon cancer so we have created a selection of unique Colon Cancer Awareness Apparel and Gifts for you and your loved ones to help spread awareness. You will also love to wear our Colon Cancer Long Sleeve Shirt and show awareness with our Colon Cancer Awareness Hat. You’ll feel great knowing a portion of our proceeds will help fund research so one day this disease will be something of the past.